When you head down to the Greek island of Crete, the one thing you can expect to find on your plate is seafood. Surrounded by water, as usually every island is, Crete is known for serving the most delightful examples of Greek cuisine, especially the kinds that has fish or octopus in it. If you are looking for the best places to eat on this beautiful island, then read on for a list of the best food that you can find for the best prices you can imagine. Waves on the Rock: In the little fishing village based on the edge of Ravdouha Beach, you can find this little hidden gem that is still somewhat of a secret from tourists. A gastronomic heaven, Waves on the Rock serves wonderful fish dishes in their restaurant, which lies at the end of a rough dirt-road that comes off of the main road. There are rooms to stay in too, if the setting doesn’t let you leave. Apostolis I & II: When it comes to traditional Cretan dishes and a wide variety of seafood, especially fish, then you get some of the freshest meals in a quieter part of the eastern harbour. The two restaurants carry the same menu but Apostolis I is slightly cheaper than the other – probably because the owner himself cooks in the second. The service is great, the food is wonderful and you will rarely find a better wine list in the entire country. O Vrakas: This isn’t much of a restaurant as it is a street-side stall. The seating area is tiny and the food, cooked right in front of your eyes, is absolutely delightful. The restaurant is, basically, an Ouzeri or a place that serves Ouzo and some light snacks. The fish is fresh and so is the grilled octopus; and even though the menu is rather limited, you will find enough to tickle your senses in this beautiful little store. Captain Fidias: Along Sfinari Beach, there are three fish taverns, or tavernas, and after you eat in all three, Captain Fidias is the one you’ll remember the most. Run by Fidias and his four sons, the restaurant is a fine example of Greek cuisine, especially the kinds the locals eat daily. The restaurant is extremely friendly and the food is brilliant, and even if they run out of fish for your meal, you can even see them run home to get more fresh fish from their daily catch, meant for their own meals back home. 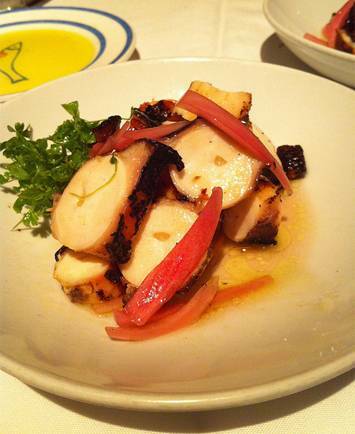 Kyma: In terms of seafood, this is another little gem that serves exactly what the locals eat. The restaurant is run by local fishermen who bring in their catch and create the kind of meals you would find on their tables. You sit on a quieter part of the beach, with little in terms of fanfare, and there are just a few tables thrown outside, under a tree. For a quiet and authentic taste of Cretan seafood, this is surely the place to come down to. Paloma: When you walk along the coast of Souda, towards the airport, you come across this tiny little fish taverna known as much for its traditional food as it is for the typical blue chair-chequered tablecloth setting. As you walk past the cemetery, you come to this beautiful place overlooking the harbour. The food is fantastic and the view is absolutely breathtaking – what more do you need? If you are looking to taste the local flavours of this fantastic island, then there are plenty of options where you don’t need to overspend you budget to taste authenticity. The food is always fresh in these places and if you are lucky, you might even see them catch it before they put it on your plate. On your Crete Holidays, there isn’t much more that you can ask for. A native of Crete, Jerry moved to the United States of America in 1984, to look for a better life. He started his own restaurant out there, serving the food that his grandmother would put in front of him. Today, that restaurant has given him a beautiful home to support his family and to make sure that the authenticity remains, Jerry keeps track of everything himself. He does return to his homeland every year, but his Crete holidays are more about finding out the latest food trends more than anything else.